Populous wanted to create an unforgettable venue in Las Vegas, which was no small task. The design team was inspired by the desert—and the strip. 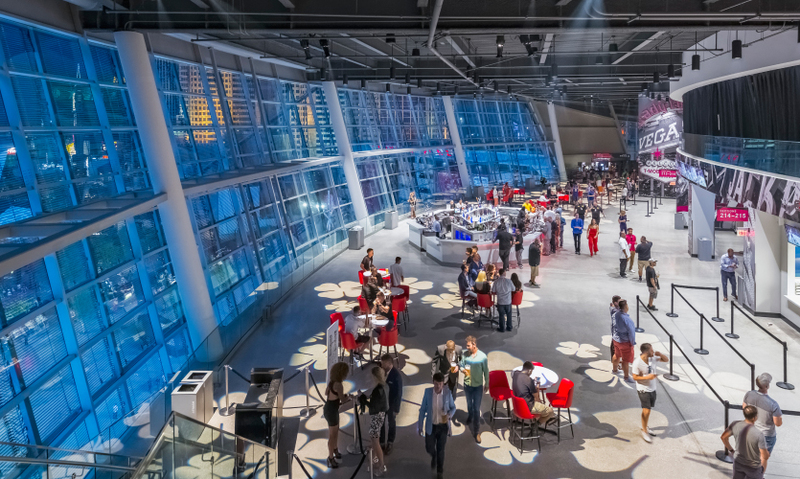 The 9,000-square-foot LED video mesh on the exterior façade can bring indoor events to the exterior event spaces. The media mesh is unique in its size, application and perforation. The pixels are placed 50 mm apart. An aerial view reveals the Toshiba plaza and the unique balance of indoor and outdoor spaces. The park area features a sculpture by Artist Marco Cochrane called "Bliss Dance." The exterior surface echoes the visual language of the desert, from the shapes of the mountains to the colors of the sky. 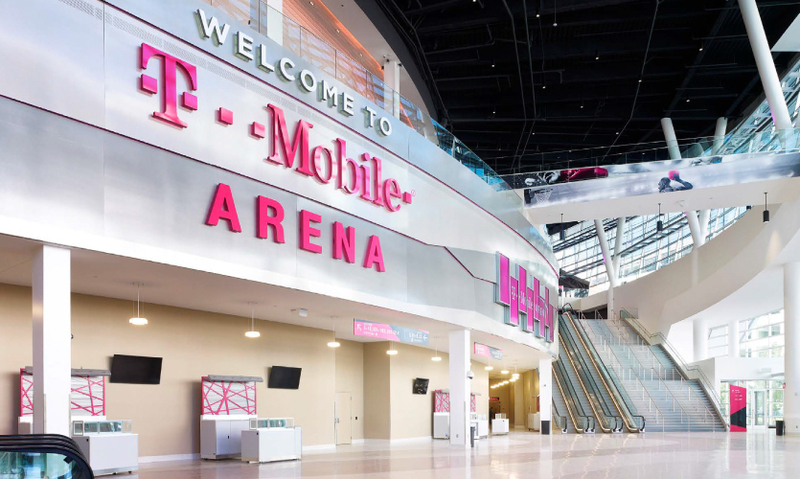 The wayfinding and signage for T-Mobile Arena was designed by Selbert Perkins Design. The media mesh allows outside viewers to have a seamless video experience while patrons inside can easily see out the windows simultaneously. Among the numerous digital displays, the centerhung stands out, with the largest sides measuring 36 feet wide and 21 feet high. Branded clubs rise high above the floor providing an altogether different arena experience. 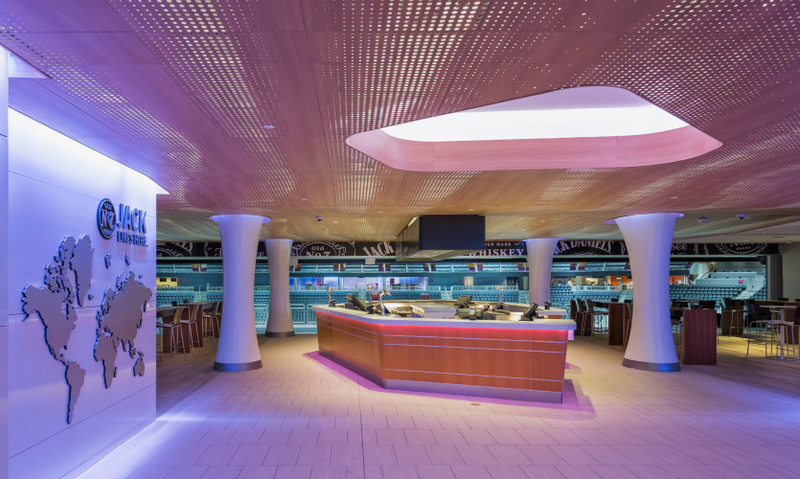 Branded lounges and clubs include names like Jack Daniels, Optum, Bud Light and Goose Island. Trying to out-dazzle the Las Vegas nightlife is a tall order, even from inside Vegas. 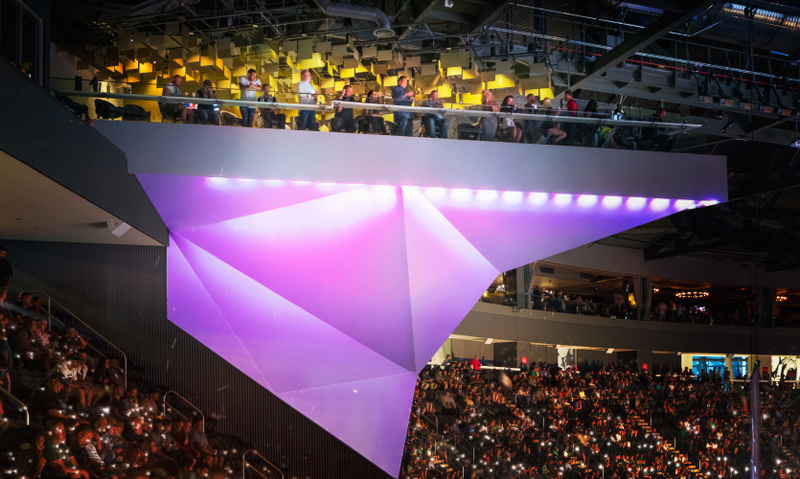 The T-Mobile Arena, one of the latest additions to the self-proclaimed “Entertainment Capital of the World,” is a multi-use monument to the desert city and luxe digitally-integrated experiences. 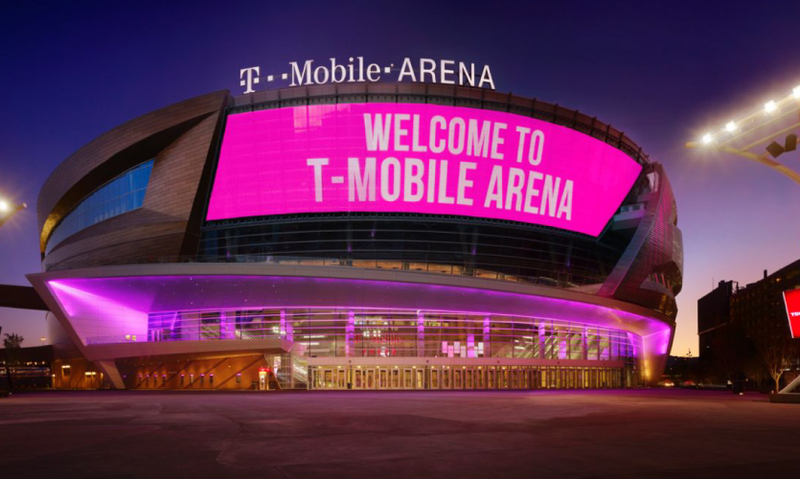 AEG and MGM Resorts International decidedly won big with their newest Las Vegas landmark, the T-Mobile Arena. The green building, designed by acclaimed firm Populous, is the largest space of its kind in the city, boasting 20,000-seats, 54 luxury and party suites, over 24 private boxes, outdoor balconies with views of the plaza and strip and a stunning 9,000-square-foot LED video mesh on the exterior façade. 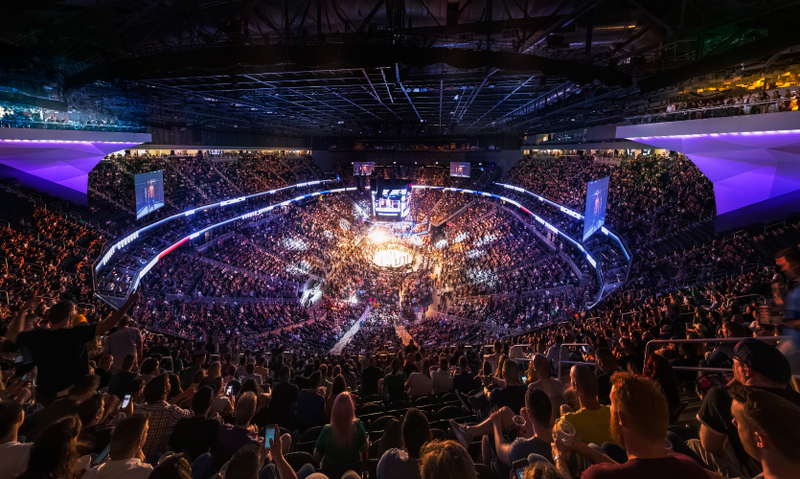 The arena hosts more than 100 events per year, from concerts and award shows, to sporting events like basketball, hockey and UFC in grand style, with many specially designed hospitality offerings to maximize the guest experience. The arena makes use of the surrounding outdoor entertainment areas like the adjoining two-acre Toshiba Plaza, beset with stages and displays. 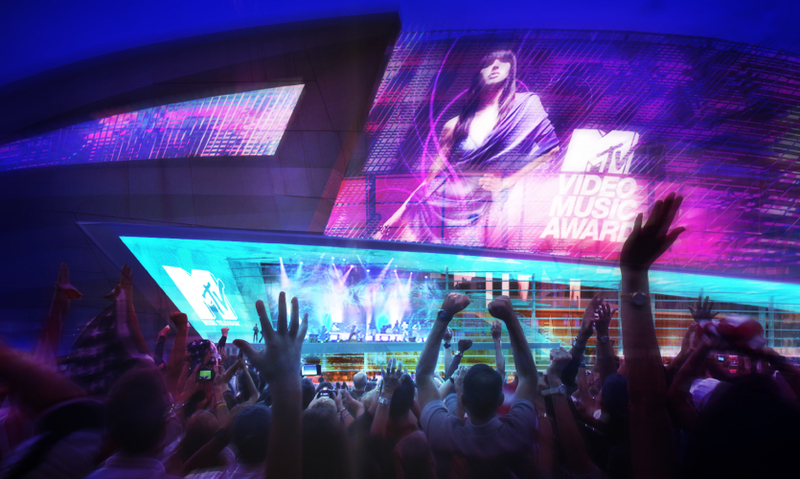 “There has been a longstanding desire to create a purpose-built professional venue that also can be the epicenter of Las Vegas entertainment—a home to the UFC, world-class concerts and an attractor for an NBA or NHL team,” explains Brian Mirakian, Director of Populous Activate, the experiential design and brand activation division of Populous. The Populous team was brought onto the project long before sponsor T-Mobile lent its name to the arena. When faced with conceptualizing a next level stadium experience, the Populous team began by thinking local—how does one “out-vegas” Las Vegas? For Populous, the human experience is the key, not just numbers and statistics. They actively immerse themselves in the place and culture first to discover its essence and what makes it special for the people that are there. Place informs architecture, not the other way around, is the Populous credo. Some numbers, however, are extremely important: 40 million people visit Las Vegas every year, and the area has a permanent population of two million. This meant that the venue had to cater to both populations. Another thing to consider: The entertainment culture of Vegas is shifting away from gambling to luxury hospitality experiences in response to what visitors want most. The Populous team set out to create the very best expression of these desires. “We were trying to create an amazing entertainment destination in the city of entertainment destinations. It was a very daunting prospect from the outset and we were pushed by the clients to explore the limits of what’s possible and integrate unique hospitality destinations and a singular approach to user-centered design,” says Mirakian. Part of the user-centered approach was mining social media. They gathered sentiments from sports fans and local residents with the goal of discovering the types of venues that garnered the most positive responses. Through this process, they determined that for the millennial audience, shared experiences like restaurants, concerts and nightclubs reign supreme. Populous responded to this and data on millennial purchasing habits by integrating next-generation hospitality venues into the design of the arena, essentially blending the high-end Vegas nightclub experience with the arena experience. The team took inspiration from the landscape, the city and the Strip, considering the visual experience of light, color and topography with the specific goal of capturing the spirit and drama of the city. 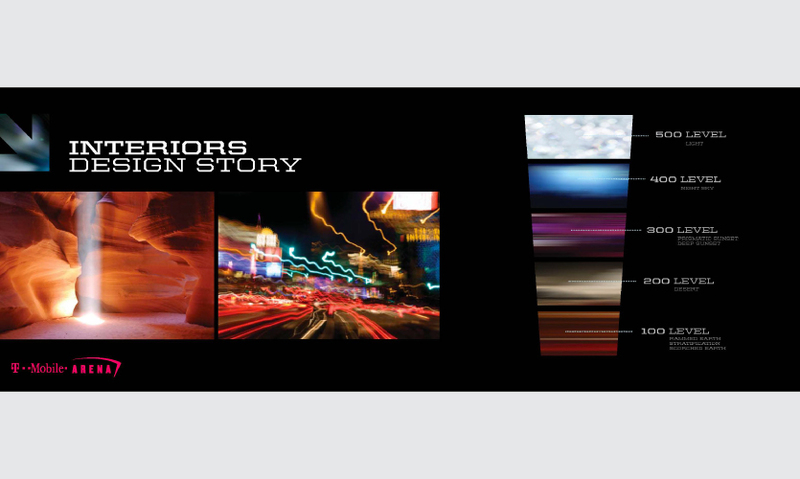 They wanted to tell the authentic story of Las Vegas, both bold nature and glitz. The building’s façades showcase the concept. The south and West sides of the elliptoid are wrapped protective bands of reflective metal that echoes the layering of the mountains. The side facing Park Avenue is a sleek glass expanse offering sweeping views of the city—with a twist—a enormous LED media mesh beckoning to visitors and reflecting the energy of the strip. The interior spaces employ a layering scheme, which was inspired by the desert sunset and strata of local geologic formations. This topography is echoed in the arena bowl, where you see monumental shapes rising from each side that house exclusive clubs—visual mountains that also accomplish something very Vegas—to see, and be seen. “Everywhere in Las Vegas, you find recreations of famous cities: Paris, Venice, and New York City, just to name a few, but nothing grand and authentic to the city itself. 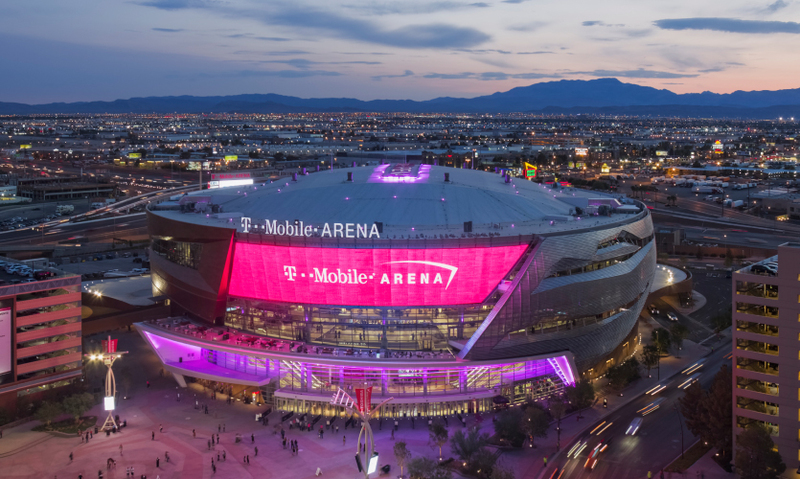 With T-Mobile Arena, we took the energy and excitement of the Las Vegas experience and anchored it to the landscape and made it truly of Las Vegas,” writes Kurt Amundsen, senior architect and principal at Populous. The activation process began by mapping out every possible point of engagement. The Populous team determines by answering critical questions like: What are the opportunities this site presents? What makes the site special? And, What are likely to be challenges with this site? The location’s proximity to the strip informed the positioning of the building and the materials used, including the video mesh that encapsulates 9,000 square feet of the front of the building. The media mesh, designed, manufactured and installed by Daktronics is intended to draw in pedestrians, making a memorable first impression of the venue. The LED video wall is trapezoidal, measuring 43 feet high by 210 feet wide and is easily seen through from the interior of the glass behind due to a 50 mm pixel width. 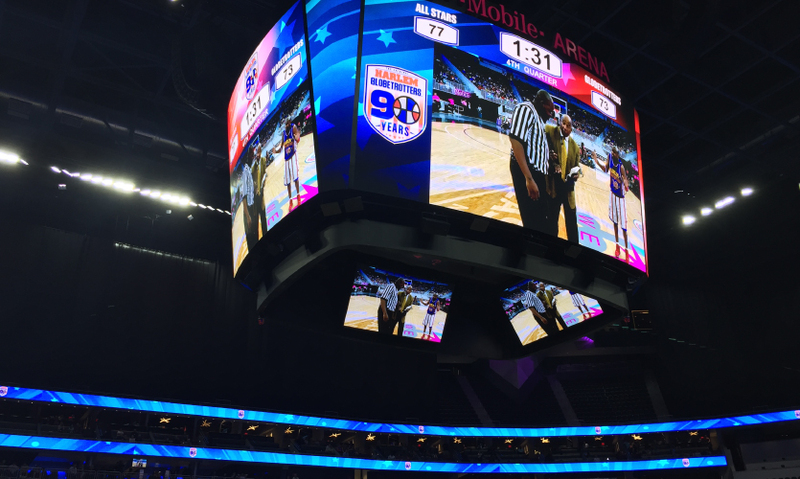 The display requires an advanced control solution due to the aspect ratio, which Daktronics accomplished using new 6000 Series Display Interface with proprietary Pure Pixel Processing (P3) technology. “The curved downward angle of the building was an exciting challenge that speaks volumes to our engineering and project management team,” remarks Luke Tingle, Senior Project Manager at Daktronics. 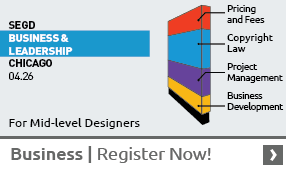 From there, the design team strove to create a seamless and exciting visitor journey. The journey is significant and interconnected: Visitors walk from the strip, through the mixed-use entertainment development, through the open plaza spaces and into the entrance before reaching the concourse, clubs or seats. Visitors then pass activations in Toshiba Plaza, like the 40-foot-tall sculpture Dancing Bliss, which originated from the Burning Man festival, and public event spaces like stages (even one projecting out of the side of the building) that house DJs and live bands. Indoor-outdoor spaces are further maximized at T-Mobile Arena with three large exterior balconies offering unforgettable views that complement the plaza lounges and elevated stage. The digital experience continues into the interior of the building. Numerous displays complement and contrast with the rich décor of the lounges, clubs and branded hospitality spaces. The largest of these is the centerhung, which the clients requested to be both of the highest quality and flexible in terms of future rigging configurations. The centerhung is composed of 12 displays, the two largest of which measure 21 feet high by 36 feet wide. Ribbon displays run along seating fascia, providing additional information and sponsorship opportunities and provide a feeling of layering consistent with the building concept. “It took many iterations and coordination balancing what was possible with that vision to get us to where we were ready to execute the work. The end result is a world-class venue that embodies what Daktronics can offer our customers, a truly unique experience for their patrons,” writes Justin Kaufman, lead engineer at Daktronics. 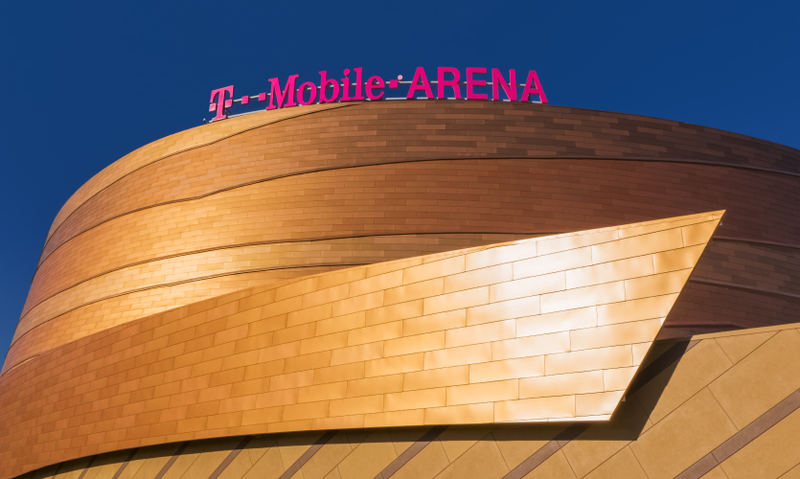 After three-year process of design and build phases, the T-Mobile Arena is a big win for all involved, from the clients, to the design team, fabricators, sponsors and most importantly, the customers. Fans of all sorts have been enjoying seeing events ranging from March Madness basketball games to Hockey exhibition games to Cirque Du Soleil and pop stars’ performances. The plethora of hospitality options makes the arena experience completely customizable and the surroundings are uniquely Vegas. "As guests arrive at T-Mobile Arena, one of the first things they see is the incredible Daktronics see-through LED video wall above the main entrance, which has been generating tremendous fan excitement and energy, especially on event nights," said Dan Quinn, General Manager of T-Mobile Arena.